John’s passion for fibreglass was first discovered whilst making canoes at Uppingham School as a child, now 40 years on John, Director of Europlanters, went back to his roots to manufacture planters for a roof terrace project on the top of the school’s new science block ‘Destination Science’ in Uppingham’s historic village. The Bursar’s aim for this new 3 storey building was to inspire new generations of young people to see science as an exciting and attractive subject to study. The roof terrace was just a small part of the £40m project invested to redevelop and transform the school. 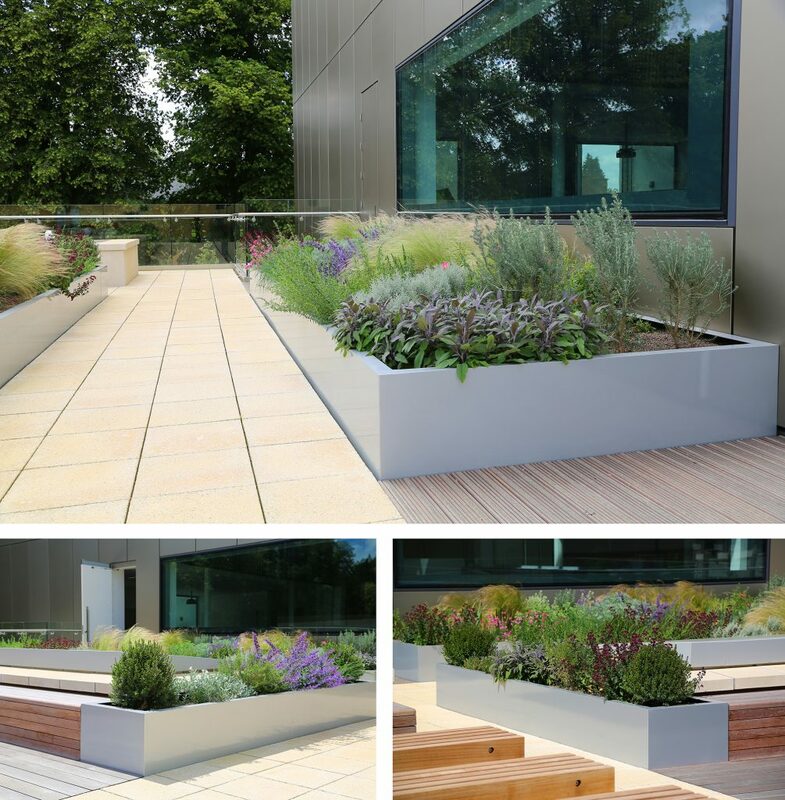 Specified by Landscape Architect Robert Myers Associates, the project consisted of manufacturing and installing 17 planters to build several flower beds ranging from (LWH) 6765/1875/530 mm to 7388/665/530 mm. These were put together to fit neatly next to paving stones and contemporary hard wood seating with hidden storage boxes. 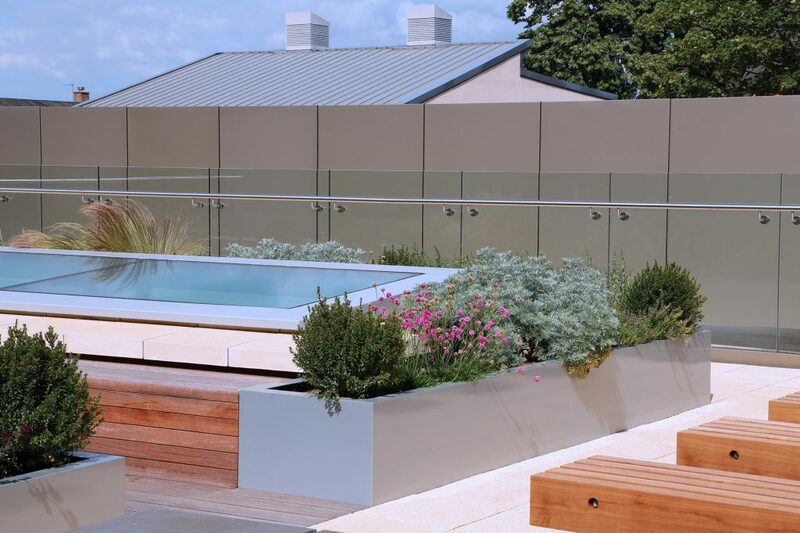 The colour RAL 9006 was chosen to match the skylights which the planters fit neatly around. The chosen metallic colour contrasts well with the anodised aluminium used to clad the building. All of which complement the local ironstone colour. 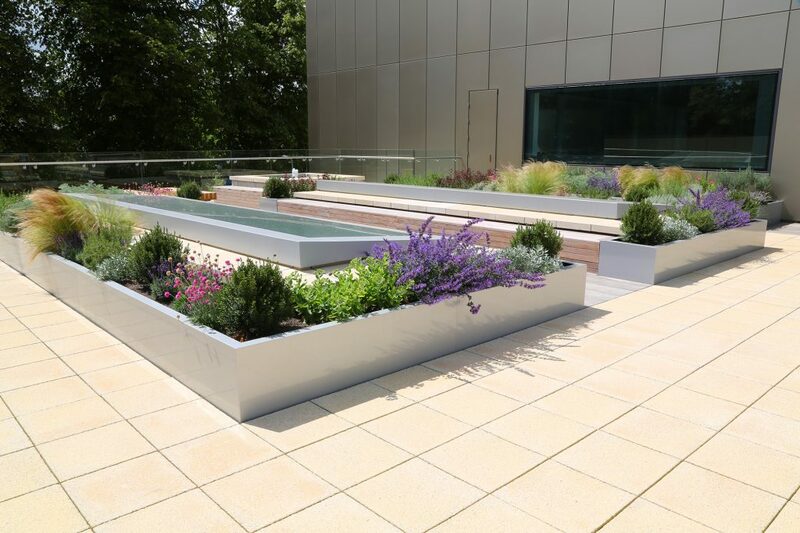 A wonderful array of plant varieties were planted by the landscapers including lavandula angustifolia, rosmarinus officinalis, sedum, salvia officinalis and selargonium crispum chosen to ignite the senses and act as a perfect haven to attract wildlife whilst on the roof terrace. The science block opened in September 2014 ‘It was an honour to be involved in this project said John Wilkes. It has brought back so many wonderful childhood memories of being a pupil at the school and it is fabulous to see how it’s been transformed’.